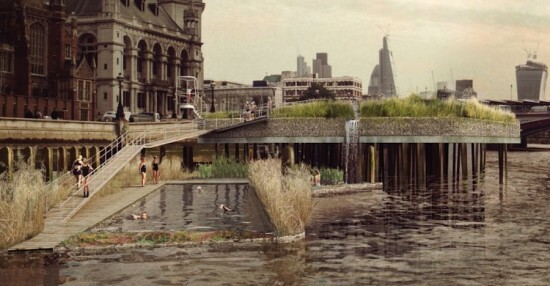 London-based firm Studio Octopi has a vision for a system of swimming pools that would make use of water redirected from the Thames. 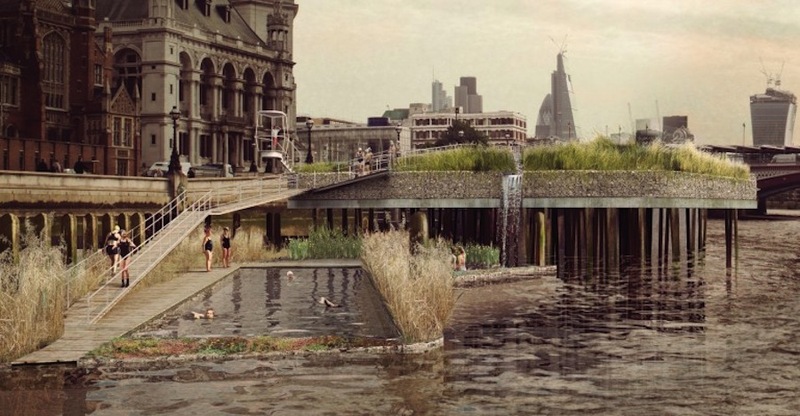 The proposal comes on the heels of Thames Water‘s controversial plan to revamp the city’s Victorian sewerage system in order to prevent the flow of excess sewage into the river. Octopi developed the project in collaboration with fellow locals Civic Engineers and Jonathan Cook Landscape Architects. What has come to be known as the Super Sewer, the Thames Water initiative involves the construction of massive new tunnel that would reduce by 96 percent the amount of raw sewage currently being ferried into the river on the back of overflow storm drainage. The nearly $7 billion price-tag attached to the project remains a major sticking point. 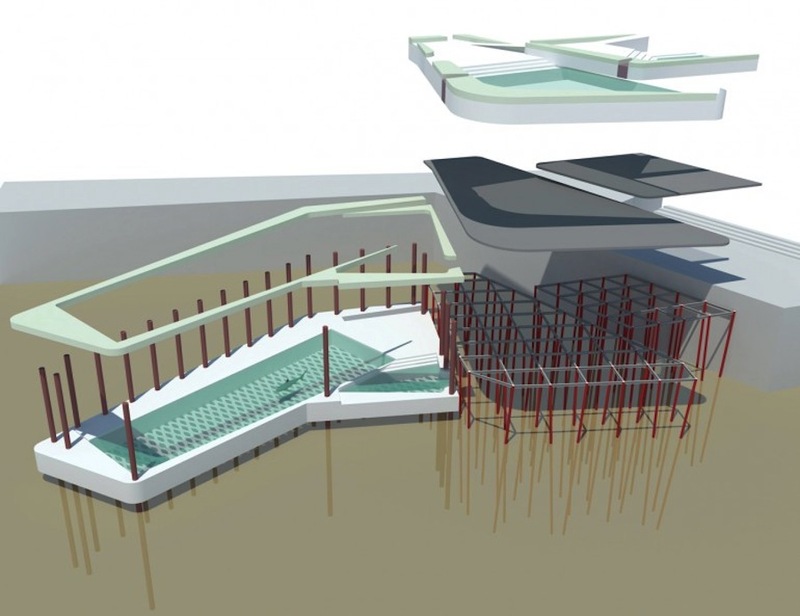 The Octopi proposal places pools at the high water mark at two Sewer construction sites, Shadwell and Blackfriars Bridge. 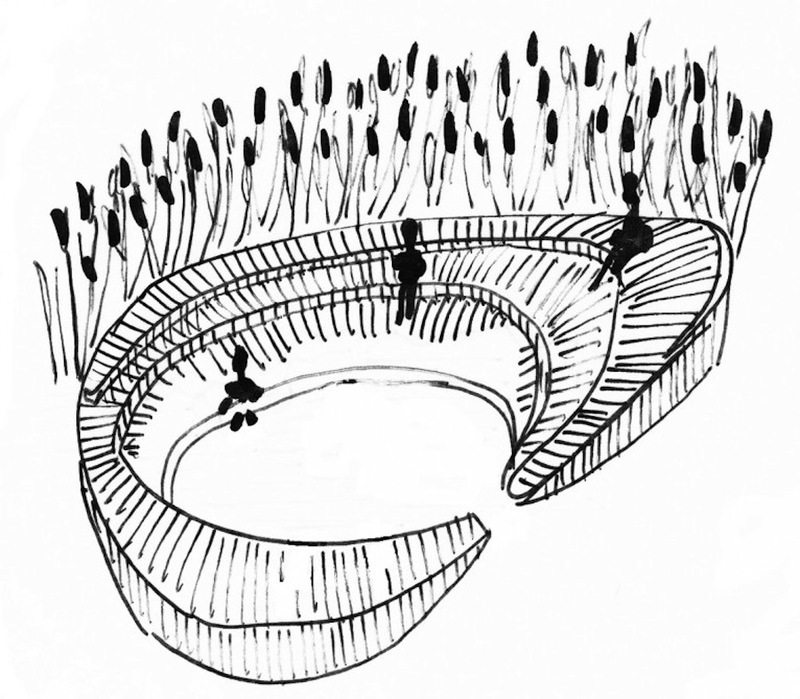 The positioning of the pools would allow them to be refreshed periodically by tidal flows. Though the fate of the pools is not explicitly linked to that of the Thames Water project, the plan is contingent on a drastic improvement in the river’s sub-par water quality. This pair is complemented by a third pool designed to float upon the surface of the river. Concrete decks provide shelter from surrounding tidal currents while also providing seating for swimmers. are also collaborators on the project, contributing the idea to dot the fringes of the structure with vegetation, a step that would theoretically facilitate the eventual incorporation of indigenous aquatic vegetation. The proposal was generated as part of London As It Could Be, a call for new visions for architectural interventions in selected sites bordering the Thames sponsored by The Architecture Foundation and Rogers Stirk Harbour + Partners.